Butane & Propane Cylinders have many domestic and commercial uses. Not only can they provide the beyond the mains benefits of natural gas but offer more versatility due to their portability. 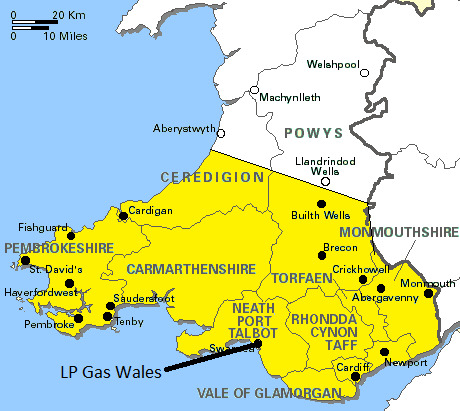 LP Gas Wales Direct will always process your order as quickly and efficiently as possible, we do state that it is always best to order on 30% to allow for unforseen circumstances such as bad weather. We can provide emergency delivery - please call us to discuss your requirements. Any Special delivery instructions such as electric gates, dogs on site, or hard to find places should be emailed to info@lpgaswalesdirect.co.uk when order is placed. If you require any delivery information this can also be obtained by emailing the above email address. The map below shows the areas within which we will delivery bulk gas orders. *Please note these delivery areas are a guideline for further information phone 01792 323740.